Okanogan County is in north central Washington along the border with Canada. It is divided into four regions, each with its own tourism draws and geographical features, which are known as Methow Valley, Heart of Okanogan, North Okanogan, and the Columbia River Region. Most of the eastern section of the county is the Okanogan National Forest and Sinlahekin Wildlife Recreation Area, just east of the Cascade Mountains. The Colville Reservation makes up the county's southeastern corner. The county has a population of 41,000. A large percentage of residents live in the Heart of Okanogan Region near the county seat, also called Okanogan, and the largest city of Omak. Additional communities include Brewster, Nespelem, Oroville, Pateros, and Tonasket. This is the state's largest county by land area and cities are fairly well spread out. 1 Beds | 0.75 Baths | 559 sq. Ft.
3 Beds | 2.25 Baths | 3414 sq. Ft.
3 Beds | 1.5 Baths | 1792 sq. Ft.
2 Beds | 1 Baths | 1014 sq. Ft.
2 Beds | 120 sq. Ft.
4 Beds | 1.75 Baths | 1944 sq. Ft.
Blue Summit Realty has the most accurate and up to date Okanogan County real estate listings on the web. Currently there are 211 homes for sale, 5 condos for sale, 3 rental properties, and 421 vacant land properties in Okanogan County. Of the 640 total Okanogan County residential listings for sale 3 are bank owned, 0 are short sales and 9 are new construction and 1 are townhomes. The price ranges from $28,000 to $1,650,000 with a median list price of $329,817 and median sold price of $176,053. Make sure to refine your Okanogan County real estate search by property type, price, square footage, bedrooms, bathrooms and more with the search tool above or view the Okanogan County listings on our interactive map. 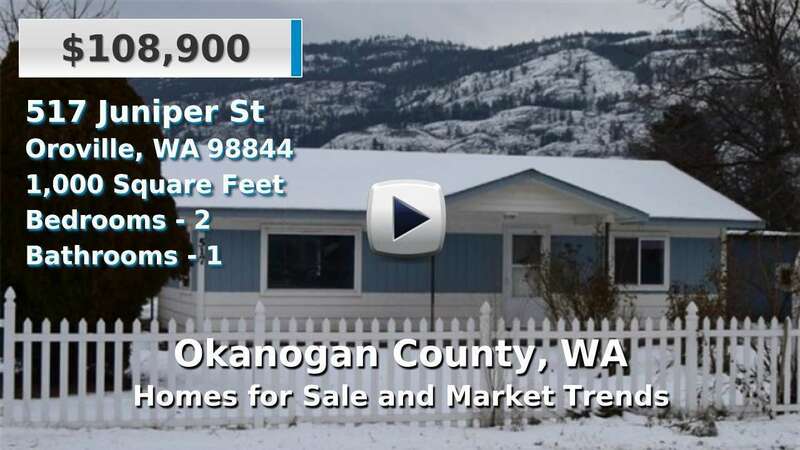 Our Okanogan County real estate listings were updated 14 minutes ago.